Skunk (the recipe for success) …Israeli new pet project …5769/2008…it’s called Skunk (‘Secret’ ingredients) …..
achtung, …troublemakers beware !! ..the new weapon of choice. Israel is deploying a new, non-lethal but highly effective and highly-offensive weapon. It’s called Skunk. Three weeks ago, Israeli soldiers burst into Awwad Sror’s small family home in the Palestinian West Bank town of Nilin. Mr Sror’s family say that when he intervened as troops arrested his younger brother, Aqal, he was shot from close range with at least three rubber-coated steel bullets. One hit him in the chest, another smashed his jaw, while a third entered his right eye socket and fractured his skull. Mr Sror, a married father of three, is lucky to be alive. But he has lost the sight in his right eye. Israel has investigated the incident and has concluded that the soldier who fired the shots acted properly when Mr Sror tried to stop his brother being taken away. The family argues it was an excessive use of force. In and around Nilin there are regular, sometimes violent, protests against the continued building of Israel’s West Bank barrier which snakes around a new Jewish settlement on the other side of the small valley. Acutely aware of accusations that it is using disproportionate force in political hot-spots like Nilin, Israel is deploying a new, non-lethal but highly effective and highly-offensive weapon. Imagine the worst, most foul thing you have ever smelled. An overpowering mix of rotting meat, old socks that haven’t been washed for weeks – topped off with the pungent waft of an open sewer. Imagine being covered in the stuff as it is liberally sprayed from a water cannon. Then imagine not being able to get rid of the stench for at least three days, no matter how often you try to scrub yourself clean. The beauty of Skunk – if beauty is the right word – is that it is said to be completely organic. No illegal chemicals, no proscribed substances – just a thoroughly disgusting mix of yeast, baking powder and a few other "secret" ingredients. The Israeli police force has high hopes of turning Skunk into a commercial venture and selling it to law-enforcement agencies overseas. Superintendent David Ben Harosh treats Skunk as something of a pet project. The way he hugged the litre bottle of dirty, green liquid close to his chest as we talked was odd – most people would surely keep it at arm’s length. "It’s totally harmless, you can even drink it," boasted Superintendent Harosh – as though encouraging me to swallow a mouthful. Reporters will sometimes go the "extra mile" to add authenticity to their story, but not this time. No way. For human rights groups, the jury is still out on Skunk. They object to the arbitrary way in which innocent bystanders can be soaked with the stuff – having to suffer for days afterwards. Then again, protestors and villagers are still being killed and seriously injured in the West Bank by more conventional weapons. As unpleasant and as disgusting as it is, being sprayed with Skunk may ultimately be preferable to being hit by a rubber-coated bullet or choking and vomiting under the effects of tear-gas or pepper-spray. The skunk bomb is touted as the smelliest weapon in the world, and has been developed as an alternative to using rubber bullets or tear gas for crowd control. Wired.com reports that the new chemical device emits an overpowering smell that is similar to raw sewage. To add insult to injury, the intense smell of the skunk bomb attaches quickly to the skin and clothes and is very difficult to wash out. The stench is described as so intense, that even hardened activist and protesters who can withstand tear gas, usually turn and run after just one sniff. The horrible smell of the skunk bomb bones is caused by a particularly foul smelling chemical. It is in fact an artificial recreation of the fluid emitted by skunks to scare off predators. 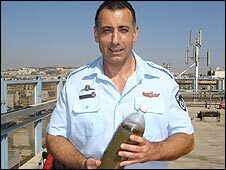 Scientist from the Israeli Ministry of Defense analyzed the chemical compound skunks release when threatened, and used reverse engineering to create a synthetic version of the liquid. The resulting chemical bomb has to be handled with care, and used at a safe distance to prevent back draft. The goal of the skunk bomb is to disperse protesters or rioters, though once they have been sprayed with a smelly liquid, police or military officials would likely be unable to arrest them because of the intense stench. The United States Army has also shown great interest in using non-lethal deterrents, and may soon develop a skunk bomb of their own. The US already uses non-lethal artillery rounds that are filled with a malodorous top-secret liquid. The US military claims that the chemical poses no threat to protesters, and is a reliable deterrent which can be used in many cases of civilian unrest. In fact, countries all over the world are expanding the development of non-lethal weapons, particularly to control riots and unruly protesters. While in many ways this is a positive turn of events (at least no one is getting killed simply because they are a protester), some activists believe that it is inhumane to expose an individual to the intensely foul-smelling chemicals, which can linger for days or even weeks afterwards. …..item 3)…….website…lookfordiagnosis.com…israeli new pet project…5769/2008…it’s called Skunk..Superintendent David Ben Harosh…..item 3)..Skunk Spray Chemistry..the recipe for success…. …..item 1B)….SkyNews … video 2:25 minutes….guaranteed to clear an area…. New Protester Weapon – Smell like a Turd news.sky.com/skynews/Home/video/Skunk-Israel-New-Weapon-B… Oct 14, 2008 Israel’s New Weapon Kicks Up Stink A new weapon used by Israel against Palestinian protestors in the West Bank is causing a stink. Skunk is a controversial new spray that drenches demonstrators with a foul-smelling liquid. 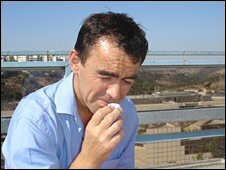 Sky’s Middle East correspondent Dominic Waghorn reports. . ……………………………………………………………………………………………………………………………………………………………………… . …..item 2)…youtube video:…..NATURE | Is That Skunk? | Baby Skunks | PBS …documentary on baby skunks…..3:56 minutes.. www.youtube.com/watch?v=vEcTVa6YjcQ&feature=channel Jerry Dragoo shows off some cute skunk kits. Newborn skunk babies have markings on naked skin, which will later be replaced by fur in the same pattern. Skunk kits are able to spray from birth, but the resulting chemical plume is not nearly as strong as that of an adult. After watching Is That Skunk? viewers may wonder: do skunks really make good pets? In the case of wild skunks the answer is no. But domesticated skunks, which have been bred in captivity for over 60 years, are known to be quite docile and loving. Still, keeping a domesticated skunk happy and healthy is a lot of work, and so is acquiring a pet skunk in the first place. It is currently legal to own domesticated skunks in only 17 states: Alabama, Florida, Indiana, Iowa, Massachusetts, Michigan, New Hampshire, New Jersey, New Mexico, Ohio, Oklahoma, Oregon, Pennsylvania, South Dakota, West Virginia, Wisconsin, and Wyoming. In most states where it is legal to own a pet skunk there are additional rules and regulations, and some require a special permit. Skunks can be demanding eaters. Their natural diet is quite eclectic. Wild skunks eat anything from insects and snakes to fruits and veggies. Some skunks also have a taste for garbage. A pet skunk’s diet should include lean protein (chicken or fish), vegetables, some fruits, and cooked grains—all fresh. Skunks have trouble digesting processed foods. When not sleeping, skunks need lots of love and attention. They are very playful, and require lots of stimulation. If left alone all day, they can get mischievous and even destructive. All skunks have long claws used for digging up worms, insects, and grubs. When raised in a house, pet skunks put their claws to use opening doors, cabinets, drawers, and even refrigerators. The house must be “skunk-proofed,” limiting access to the curious creatures. Pet skunks are also known to steal blankets, towels, sweaters, and other soft items that they bring to their sleeping den. . ……………………………………………………………………………………………………………………………………………………………………….
. …..item 3)..youtube video:……NATURE | Is That Skunk? | Skunk Spray Chemistry | PBS …the recipe for success….1:23 minutes.. www.youtube.com/watch?v=Jl7HmfGar60&feature=channel Professor William Wood of Humboldt State University examined the chemical properties of skunk spray samples. He discovered several new compounds in the skunk spray, including a thiol. A thiol is a type of sulfur-based compound found in garlic and onions. ……………………………………………………………………………………………………………………………………………………………………. . . . .
Keywords: Israel. Israeli new pet project. It’s called Skunk. Achtung, bitte bemerken. Troublemakers beware !!. The new weapon of choice. Life isn’t fair. Go forward. Ja, das es ist !!!. BBC. Nilin. Israel’s West Bank barrier. The beauty of Skunk. Is that it is said to be completely organic. No illegal chemicals. Superintendent David Ben Harosh. The way he hugged the litre bottle. Dirty, green liquid close to his chest. It’s totally harmless. You can even drink it. Yeap, life isn’t fair. MEHR ODER WENIGER !!. Is That Skunk. Baby Skunks. PBS. Jerry Dragoo. Some cute skunk kits. Skunks can be demanding eaters. Skunks needs lots of love and attention. The house must be skunk-proofed. Professor William Wood. Humboldt University. Examined the chemical properties of skunk spray samples. Thiol. A thiol is a type of sulfur-based compound found in garlic and onions.